Result: Andreas Seppi defeated Florian Mayer by 6-2, 6-4. An outstanding performance was seen from Andreas Seppi against Florian Mayer in all the sets. Florian Mayer opened the scoring of the first set. However, Andreas not only recovered the lead after some time but he eventually won the set by 6-2. The second set started and Florian Mayer again took the lead in this set. Even after his hard struggle, Florian still lost this set by 6-4 and failed to make it to the next round. 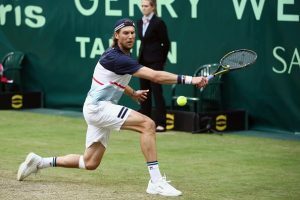 Andreas Seppi will now play against Borna Coric in the Quarter finals of the Halle Open 2018. Result: Roger Federer defeated Benoit Paire by 6-3, 3-6, 7-6(7). The most exciting and stunning match of today was played between Roger Federer and Benoit Paire in the round of 16. Roger took a great start as he took the lead in the opening set. Benoit Paire eventually lost the first set by 6-3 as he was only able to score a total of three points. Benoit Paire opened the scoring of the second set and he ultimately won it after Roger lost two points on his serve. The third set was the most thrilling one as it came to a tie-breaker after the score was levelled at both sides. Roger Federer finally won the set on tie-break and made it to the next round. Roger will face Matthew Ebden in the Quarter finals of the Halle Open 2018. Result: Ivan Dodig and Rajeev Ram defeated Robin Haase and Marcel Granoller by 7-5, 7-5. What an outclass performance was seen between both the pairs in all the three sets. Ivan and Rajeev opened the scoring of the first set when Robin and Marcel failed to take the lead on their serve. Ivan and Rajeev eventually won the first set by 7-5 as Robin and Marcel both lost a total of four points on their serve. The second set started and Ivan and Rajeev again took the lead this time. However, Robin Haase and Marcel Granoller again struggled very hard to win this set but eventually they lost it again by 7-5. Ivan Dodig and Rajeev Ram will now face Marcelo Melo and Lukasz Kubot in the Quarter finals of the Halle Open 2018. Result: Alexander Zverev and Mischa Zverev defeated Jan-Lennard Struff and Tim Putz by 6-3, 4-6, 10-3. Alexander and Mischa Zverev opened the scoring of the first set with a brilliant ace. 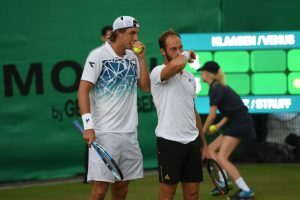 Jan-Lennard and Tim were only able to recover three points as they eventually lost the first set by 6-3. The second set started and this time Jan-Lennard and Tim opened the scoring of this set. Despite struggling hard in this set, Alexander and Mischa Zverev lost the second set by 4-6. The match now moved to the final set. Alexander and Mischa Zverev not only took the lead in the decisive set but they ultimately won it by 10-3. Alexander Zverev and Mischa Zverev will now play against Nikola Mektic and Alexander Peya. Do join allsportspk to see the highlights of the 7th day of Halle Open 2018.